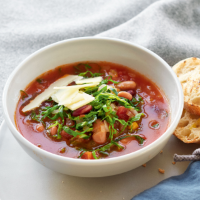 An easy vegetarian soup that is hearty enough for a main course. Trim and finely dice the onion and celery, reserving any celery leaves for garnish. Place the diced vegetables in a large covered saucepan with the olive oil and bay leaves and cook gently for 4-5 minutes, until softened but not browned. Add the beans with their sauce and the tomatoes to the pan. Fill each can twice with cold water, adding it to the pan with the bouillon powder or stock cube. Bring to the boil, season to taste and remove the bay leaves. Add the finely shredded greens or cabbage and cook for 3-4 minutes, until tender. Meanwhile, finely chop any reserved celery leaves. Season the soup again then ladle into bowl and garnish with the chopped leaves. Serve with cheese and slices of warm ciabatta bread, if you wish.